Microsoft CEO Steve Ballmer speaks about the release of Microsoft's new operating system, Windows 7, in Toronto on Oct.21. Image Credit: Reuters . The release of a new version of Windows, the core product of the world's biggest software company, is always a key business moment.October 22's launch of Windows 7 was more important than most. It comes in midst of a Microsoft overhaul of some of its top products, such as its internet browser, mobile phone software and internet search engine, as it tries to catch up with better-received and more innovative software from companies like Google and Apple. It faces what once would have been unthinkable: a challenge to its PC operating system monopoly, as Google gets ready for a mid-year 2010 launch of its own software for netbooks, the one area of the PC business that has grown strongly through the recession. "If it really works, and we believe it will, then it's a very distinctly different way of doing desktop computing," Eric Schmidt, Google chief executive, said last week. Coming after the debacle of Windows Vista, which tarnished its most valuable brand, it is vital for Microsoft that Windows 7 gets off to a flying start. 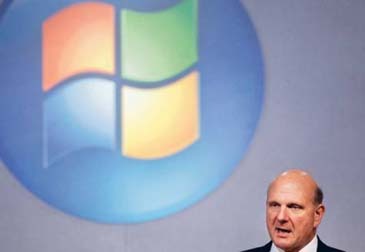 Steve Ballmer, Microsoft chief executive, refuses to accept the company has fallen behind in innovation, although other executives have conceded its browser and mobile software are in need of overhaul. "The stars may be aligned in terms of when everything's available but I'm certainly not apologetic," he says. "We've been doing a lot of good work over the last couple of years." While the technology industry has been looking to a world beyond the PC for more than a decade, the PC is still one of the industry's main engines. For Microsoft, the PC operating system accounts for 42 percent of its earnings, even as it has fallen from a third to a quarter of its revenues since 2002. A large part of the technology industry, from hardware makers to software producers that rely on customers buying better-equipped PCs to sell new versions of their own software, banks on Windows 7 to help lift it out of the past year's slump. If pre-launch buzz were the decider, Microsoft would have won this battle. The software has been greeted with favourable reviews, if only because it finally represents a step beyond Vista. Its broader effect is harder to judge. "Might it help galvanise the whole [PC] ecosystem? Probably not," says Ballmer, though he adds that it certainly can't hurt. Business customers, who account for the lion's share of PC sales, held back from renewing their older machines during the recession. Since many companies only switch to a new operating system when they buy or lease new hardware, that could slow the shift to Windows 7. "It's not the top priority — people are not clamouring to get new PCs," says David Smith, an analyst at Gartner, the technology research firm. Yet the fact that relatively few companies upgraded from the earlier Windows XP to Vista is a reason why many are likely to move to 7, even if not immediately. Corporate chief information officers such as Mario Leone at Ingram Micro, which has 13,000 employees, says the old XP is near the end of its life. "We've amortised this operating system just about as far as it can go."